Economy Candy: Happy “Treat or Treating”! My friend and I discovered Economy Candy last week, literally 2 kids in a candy store. This place is a must go for “Treat or Treating”! cuz let’s face it, we’re too old to knock on our neighbors doors tomorrow. There was so much variety, we didn’t even know where to start. Brought back a lot wonderful childhood memories, and even though she grew up in the U.S and I was in South America, some things were cool without borders, case in point: Garbage Pail Kids! (we called them“basuritas”). How cute are they? we both use to love them as kids, gross, but extra cute right? Kinder eggs! I had a huge collection of the toys, love love love. 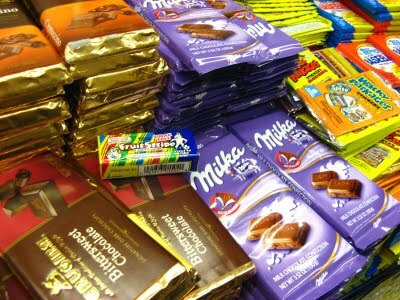 We didn’t have Hershey’s back in Argentina, instead, we ate Milka, which is way better, very rich and creamy milk chocolate, they didn’t carry the airy or nuts ones that I like or else I would of stocked up. I can’t even begin to list everything they have, every inch of the store is stocked with sweets. I walked out with some pop rocks, giant lollipops for my friend’s kids (unless I eat them first) and whole giant pack of dulce recuerdos (aka sweet memories). You have check it out yourself, it’s “Treat or Treating” every day in there! FUN! FUN! FUN! I love this place! All of the packaged candy is great, but the real treats are in the case by the register in the front. The chocolate-dipped Oreos and chocolate-dipped s'mores are INSANE. Oh wow, that does look like a fun place to go!